The Oklahoma City Thunder were poised to pull of an epic upset as they sat on a 3-1 lead on the 73-win Golden State Warriors. That now seems like a long time ago. The Thunder had an incredible opportunity to close out the series last night as they nursed a lead in the fourth quarter, but Klay Thompson went wild with 11 three-pointers, which seemed to inspire Steph Curry to return to MVP form as well. 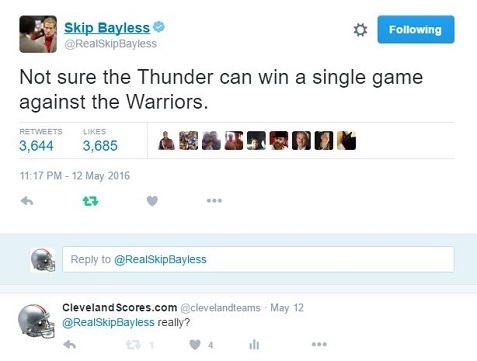 Not everyone was as wrong as Skip Bayless on this series. I replied right away to his silly tweet as it was clear after the San Antonio series that Oklahoma City was a team to be reckoned with. Kevin Durant and Russell Westbrook now have a team around them with some size, so OKC has length along with being perhaps the most athletic team in the NBA. Meanwhile, Steph Curry was awfully quiet for an MVP. Let’s see what happens next. This should be a great series! Stephen Curry and John Wall had a heated Twitter exchange last week, leading to a showdown on Saturday, February 14th, during NBA All-Star Practice where Curry and Wall will go shot-for-shot in the Degree Battle of the Game Changers.